If you’re feeling cramped in your home, the solution may be closer than you think. Rather than relocating, consider remodeling your basement. Basements offer a ton of square footage that can be designed to meet any of your needs, whether you need a playroom, a bar, extra bedrooms, or an entertainment area. For basement remodeling, Philadelphia homeowners trust A-K Custom Interiors to maximize their space. In addition to providing additional living space, there are some other great perks to a finished basement. Your brand-new basement can also lead to an increased quality of life, as you’ll have a new space to socialize with friends and spend time with family. And, on the more practical side, homeowners can expect more than a 70% return on investment when complete their basement remodeling project. When it comes to basement remodeling, there are some special considerations that must be made. Typically, basements are dark, have limited square footage, and don’t have a ton of personality or style. Thankfully, custom built-ins from A-K Custom Interiors address all of these issues! Lighting in built-in furniture is especially useful in basements known for their low ceilings. With custom built-ins, we can add lighting anywhere you want. Recessed lights in the shelving, sconces alongside shelving, or task lighting in workspaces are just a few examples. 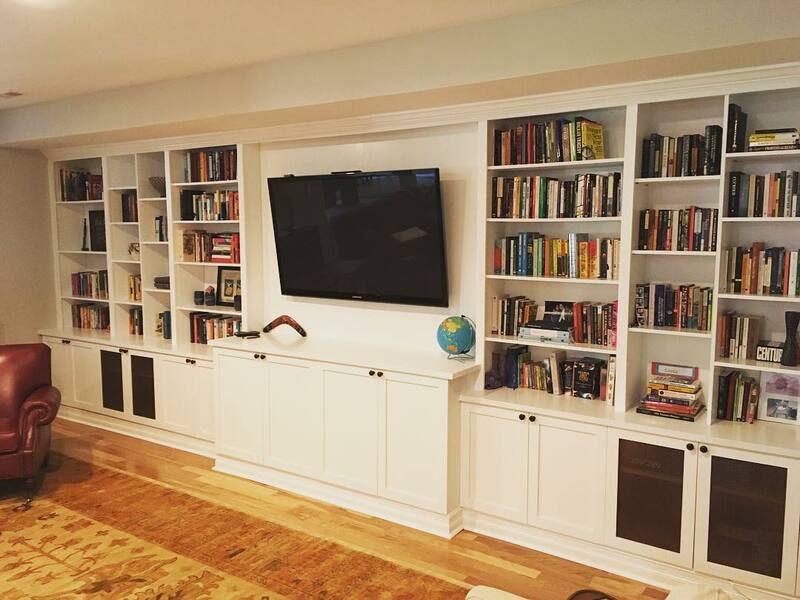 Check out our portfolio to see examples of our basement built-ins. There’s no better way to maximize your space during a basement remodel than with custom built-ins. We can build around ductwork and pipes as well as install shelving all the way to the ceiling. We’re also able to make great use of those odd corners and nooks that some older Philadelphia basements are known for. Your basement doesn’t have to feel like a basement. With custom built-ins, your newly remodeled basement can feel like a theater with a custom entertainment center or like a stately study with wall-to-wall shelving. Adding trim and moldings is a timeless way to add character and style to your basement. Ready for Basement Remodeling? Philadelphia’s A-K Customs Can Help! Get in touch with us at 215-839-6659 or by emailing us and we’ll get your complimentary consultation scheduled! Previous post: Are Wall Units Outdated? Not When They Look Like This.